In fact, there will be even more construction around our Berkeley campus. The powers of UC just approved  money for a revamp of Memorial Stadium, in addition to the construction of a building called the Helios Energy Research Facility (or HERF, as we hope it will be nicknamed), which will be home to the Energy Biosciences Institute. Memorial Stadium will stay where it is, but it needs to be retrofitted and renovated. (It is, for lack of a better term, seismically challenged at the moment.) They will also be “upgrad[ing] restrooms, food service and public safety facilities.” The number of seats will also be reduced from 72,000 to 63,000, presumably to help control crowding. To accomplish all of this takes time, of course. The stadium will be closed during the 2011 season and then open again in 2012. 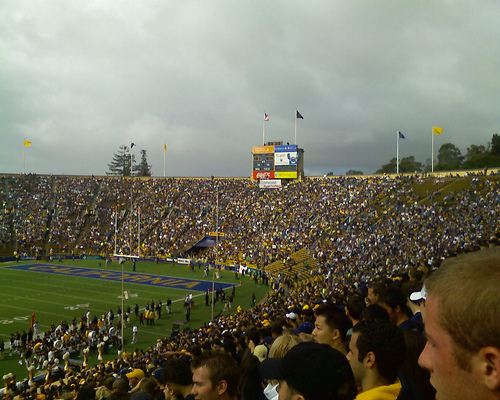 While it’s being rebuilt, our Cal Bears will just have to triumph elsewhere. Small price to pay for a retrofitted stadium. Especially since the stadium itself “straddles the Hayward fault.” We think we speak for everyone when we say that fault-straddling should not be undertaken without some kind of protection.